*due to lower traffic on this site, price charges here are lower. 1. During your sponsoring period with us, we will randomly move your ad up/down with other ads along the sponsors side bar space to keep the page constantly fresh and updated for readers. 2. First come first serve basis. If your ad has expired and there is a queue for the space your ad is previously using, you'll have to queue up for it if you wish to sponsor us again in that space. 3. Animated ads are allowed but with maximum of 3 images. 5. 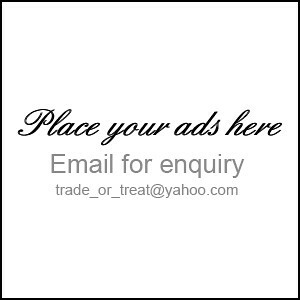 If interested, please provide to us your ad in the pixel size chosen in jpeg or gif (for animated) at least 1 week before launching of your ad and your url link. Please bank in the full amount payment to us before the launching of your ad as well. 6. Delay of launching date will not push the expiry date further on. Reservation for the space will only last for 3 days and the space will be open to others. Owner bear their own delay consequences. 7. I've heard complaints about paying for the ads in long term but the blog dies off sooner. 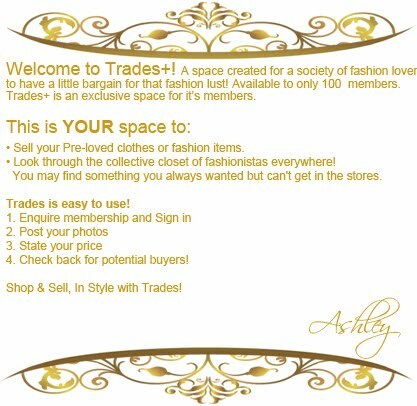 Don't worry for Trades+ is updated by it's 100 members. So new post will keep coming in as long as there's someone who wants to sell their pre-love clothes.